Map of the Site of the University of North Carolina and Chapel Hill, November 7, 1792: Electronic Edition. 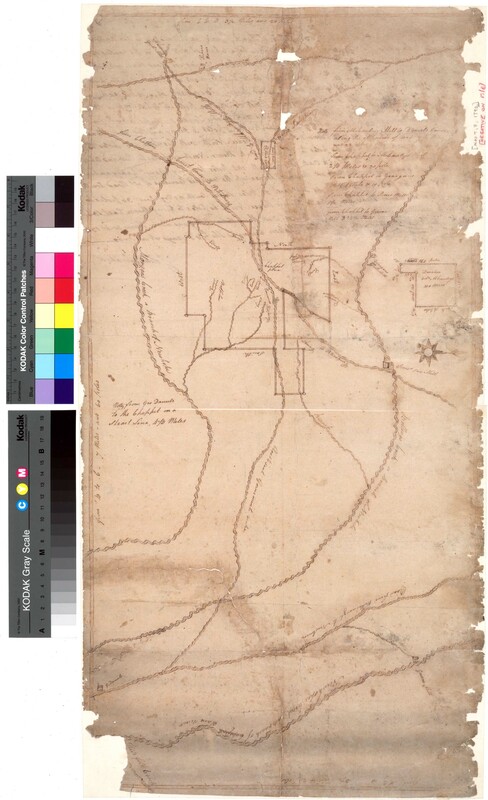 Title: Map of the Site of the University of North Carolina and Chapel Hill, November 7, 1792: Electronic Edition. 2006-03-10, Brian Dietz finished TEI/XML encoding. Note from McCauley's Mill to Daniels House along the course of road [7½] miles and 23 poles. Note from Geo Daniels to the Chappel on a strait line 4¼ miles. [The written] Plan illegible  acres of land given as a donation to the University [situated] & lying in the bounds of [Orange] and on New Hope Chappel Hill and on the waters of Morgan's Creek and Bollings Creek, [the water] of New Hope running in Haw river and bound on the North by Land of [Benj Yeargans ] and on the East by land of John Morgan and on the West by land of James Craig and Edmond Jones. Beginning at a white oak commonly called the Old Chappel [Corner] [thence] South 132 poles to white oak in the illegible then illegible poles [west] illegible oak thence South 57 poles to Hicory and illegible oak thence west 236 poles to Hicory thence North 4 poles to Hicory and Red Oak thence West  poles to Black jack in Edmond Jones's Line thence North with his line 185 poles to illegible Corner thence East 68 poles to Spanish Oak thence North 50 poles to Red and white Oak thence East  poles to Black Oak thence North 194 poles to Hicory Benj Yeargan's Line thence East 223 poles to Red Oak on the road thence up the various courses of illegible road South illegible Degs West 62 poles thence South 45 Degs West 80 poles thence South 29 Degs West 36 poles to Hicory Barbee's Corner thence East 143 poles to Hicory thence North 60 poles to Hicory thence East 134 poles to post Oak thence South 82 poles to post Oak in John Morgan's line thence west 134 [poles] illegible thence South to the first station surveyed the 7th & 8th days Nov. 1792.